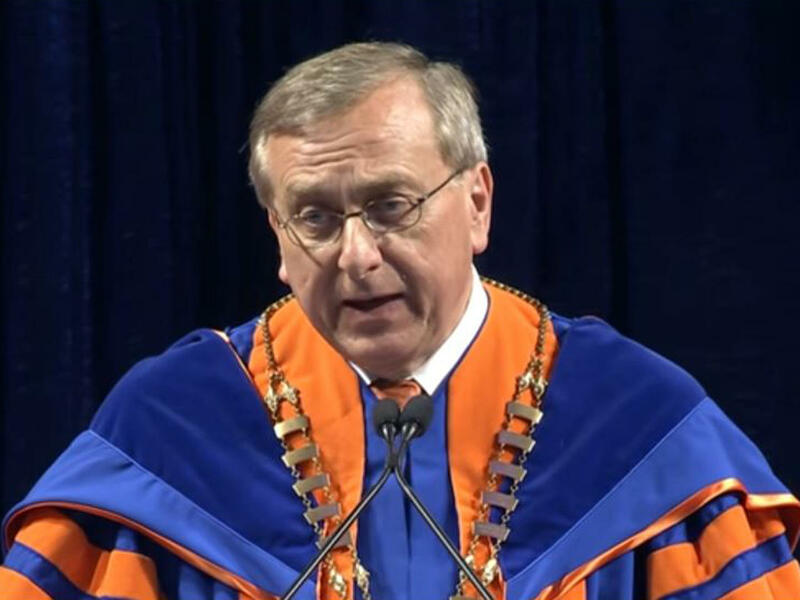 The president of the University of Florida apologized for the school being "inappropriately aggressive" while physically moving graduates across the stage during a commencement ceremony over the weekend. Videos posted to social media showed a man dressed in an academic robe grabbing graduates and pushing them while they were displayed on the Jumbotron at the school's basketball arena on Saturday. Witnesses said African-American grads appeared to be singled out. "We were inappropriately aggressive in rushing students across the stage," President Kent Fuchs said on Twitter on Sunday. "I personally apologize, and am reaching out to the students involved. The practice has been halted for all future ceremonies." Fuchs also apologized while speaking at another commencement ceremony on Sunday. The school posted his statement to YouTube. Witnesses said that most of the graduates grabbed by the commencement marshal were black, according to CBS Gainesville affiliate WGFL-TV. In one video posted Saturday, spectators booed the marshal after he grabbed a graduate with both hands and moved him out of view of the Jumbotron camera. In other videos, the marshal puts his hand on graduates' shoulders and pushed them along in line. Fuchs said nearly 10,000 students are graduating from the school this spring.